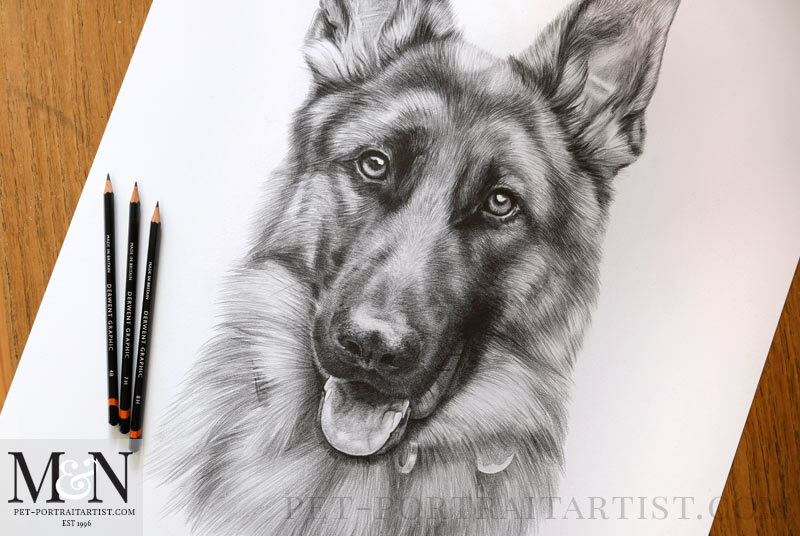 Welcome to my latest Alsatian Pencil Drawing of Nash. The portrait was hand drawn by myself for clients in North Carolina, USA. 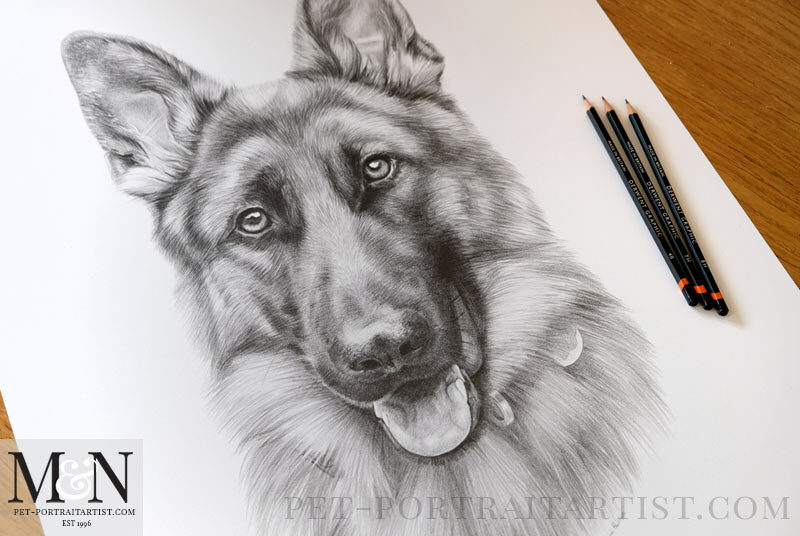 Mike wanted to have a large sized portrait, which also worked well for his breed of dog. Mike emailed me his favourite photo of Nash and it was perfect to work from. In addition he sent others for me to see, to get a feel for what Nash was like. 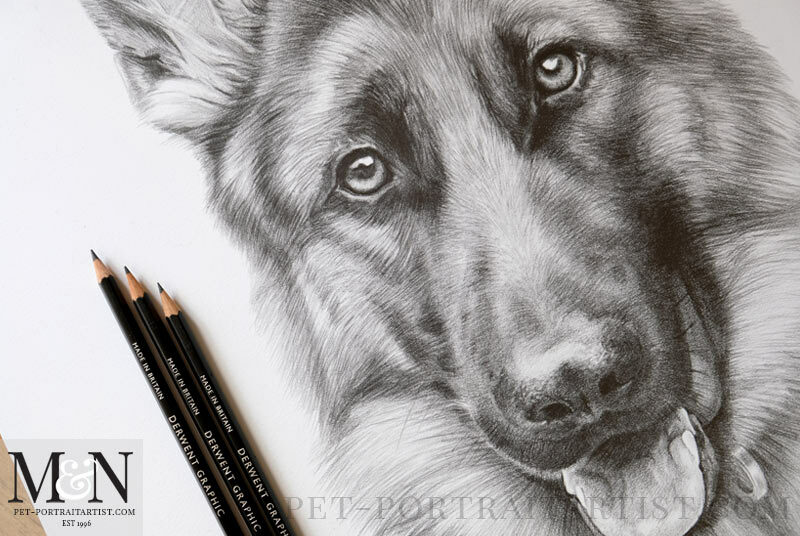 Therefore it’s always handy to see as many photos as possible for my pencil drawings. There is no limit to our inbox so we encourage all clients to bombard us with photos! The portrait was completed at 24 x 18 inches and then a frame is added onto that size, so it was pretty large overall. 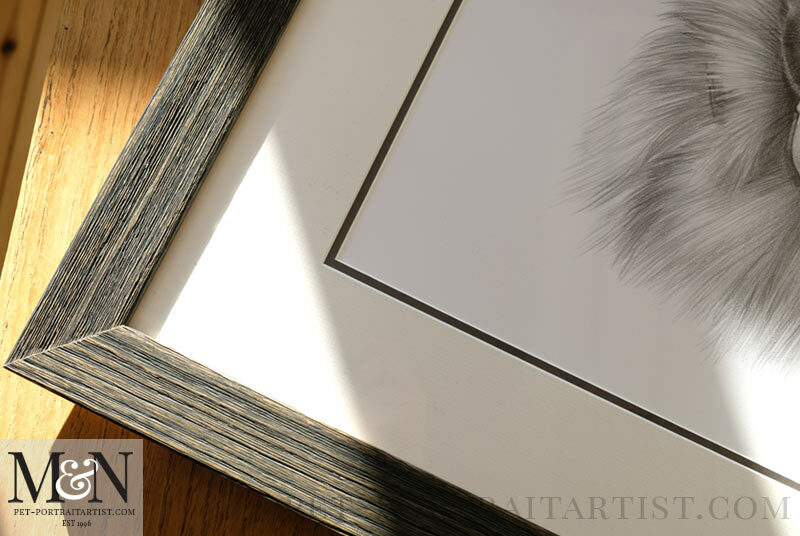 I create my pencil drawings to almost any size from very small to very large, so can accommodate most requests. The portrait of Nash came out really well, I was very pleased with the finished drawing, as was Mike! You can read a testimonial from Mike below. We got the drawing and its stunning, thank you very much! 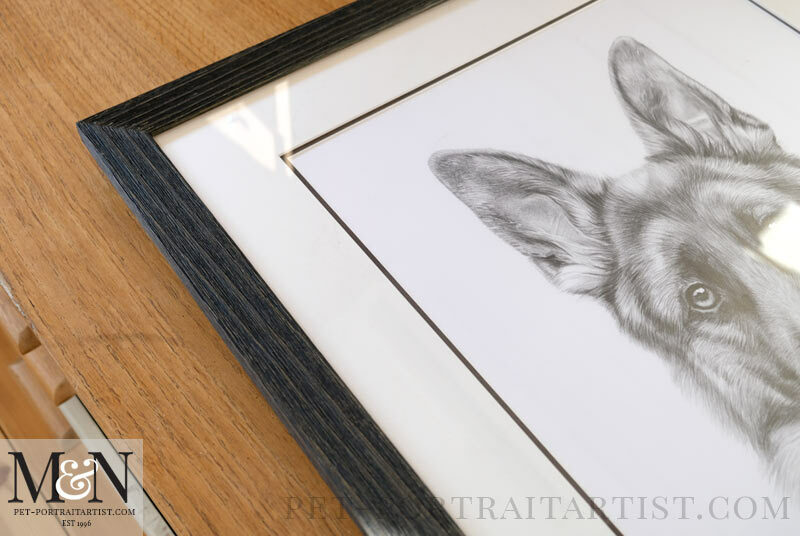 Mike also chose to have the pencil drawing framed using our new frame called Osborne. You can see more photos of the Osborne Frame on my website. 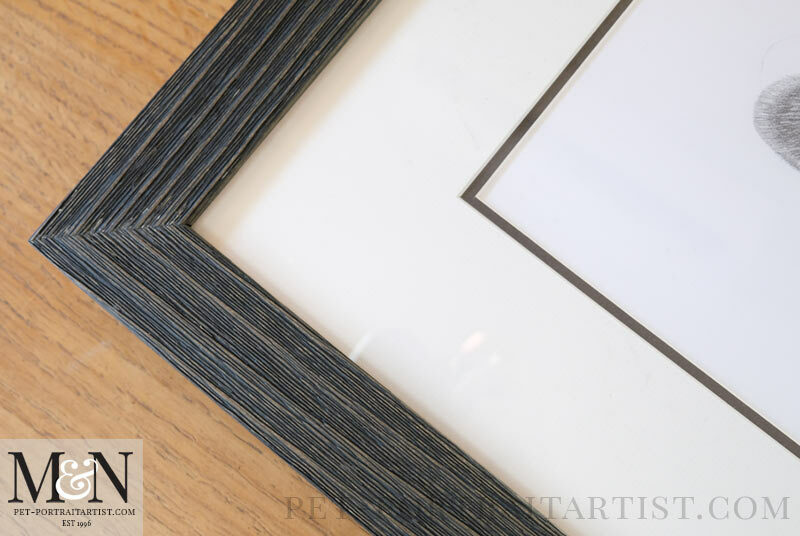 It is a really lovely frame, quite contemporary and very smart. Also it matches well with the coffee coloured inner mount colour. Consequently bringing the frame and the portrait together beautifully. 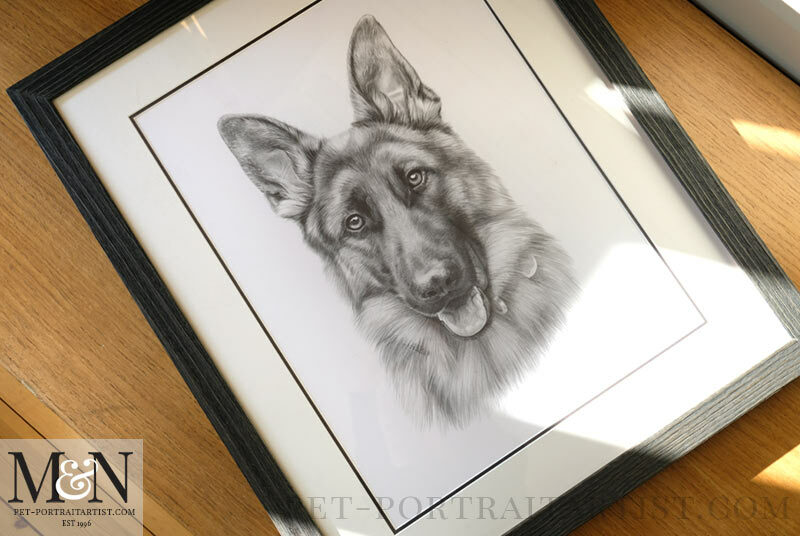 If you are thinking about ordering a pencil drawing and would also like the Osborne frame for your portrait just let me know. If you have an idea of the kind of size you would like I can get a quote for you from our framers. Above all, Amanda our framer is amazing and very accommodating. Our frames are ready within two weeks which is perfect! She looks after us very well!